Sarah at Sarah Did It! is continuing to host us on Wednesdays, so please check out the temperatures around the world. Feel free to join it! It's been a red week! All the temperature hexies are wonderful. We're getting up into the 'reds' here too. Your hexagons look great together. 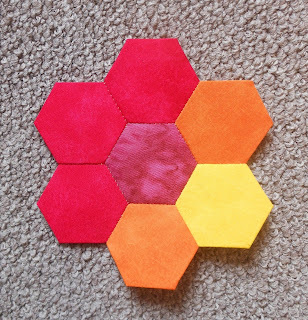 Beautiful colors on your hexagons. Wow, a very red week! For a moment I thought the middle hexi was brown, but I'm glad to be mistaken. My goodness, I don’t know how you cope with the heat, although it looks great on your flowers!